I’d really like it if you all would welcome Margaret L. Carter to the stage! Margaret L. Carter specializes in vampires, having been marked for life by reading DRACULA at the age of twelve. Her vampire novel DARK CHANGELING won an Eppie Award in the horror category in 2000. Other creatures she writes about include werewolves, dragons, ghosts, and Lovecraftian entities with tentacles. 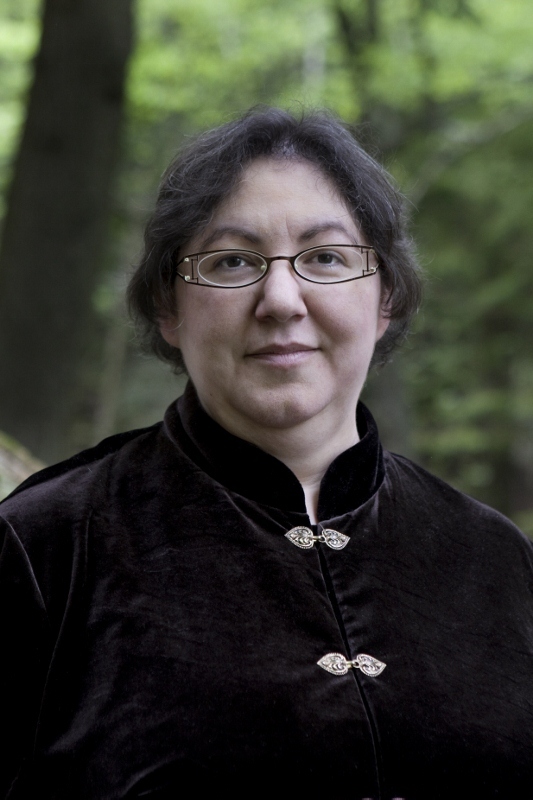 In addition to her horror, fantasy, and paranormal romance fiction, she has had several nonfiction books and articles published on the supernatural in literature. Explore love among the monsters at her website, Carter’s Crypt, at http://www.margaretlcarter.com. 1. Who was your first author crush and why? Ray Bradbury. His early fiction portrayed the horror motifs I already loved (in my early teens) in a lyrical style and sometimes, as in “Homecoming,” from the viewpoint of the “monster.” My favorite collection of his stories is THE OCTOBER COUNTRY. 2. What was your first clue you were a writer? Was it a long journey or a short one? Have you always known? I started at about age 13. Having read DRACULA at the age of 12, then scoured the library for supernatural horror fiction and bought paperbacks of vintage pulp authors such as Bradbury, Bloch, Matheson, and Lovecraft, I couldn’t find enough of what I wanted to read (in the early 1960s). I especially wanted stories sympathetic to the “monsters.” So I started writing them. My first completed story involved love between a man and a ghost. I craved paranormal romance long before it became a marketing category. 3. What are some of your writer-esque quirks (do you have to be in your pjs? always facing the door? Do people look at you after something funny happens and say ‘that’s going in a book, isn’t it?’)? I can’t read anything without noticing, and sometimes complaining out loud about, stylistic, research, proofreading, and continuity errors. The elevator gets stuck. The priest prays for patience. The clown climbs up the wall to try the trap door in the ceiling. The writer opens a pad and starts taking notes. NY or LA – L.A.
1. pick 6 sentences from your WIP or other work. So here’s my entry. Playing with the title a bit. Raven’s Blood or Raven’s Warning sound better? I laughed at that. I heard him laugh too, right before he slammed against the door. My puny little blockade wouldn’t hold that for any length. I felt him stomp a few steps back for another go. With nothing left to lose, I leveraged myself against the building, and leapt over the railing. I heard a growl as the door to my balcony exploded. Hello again! Another author has been gracious enough to be my next victim…err…guest. Please welcome Keena Kincaid! Author Keena Kincaid likes to say she writes romances in which passion, magic and treachery collide to create unforgettable stories. The truth is she’s usually kidnapped by tall, handsome men, who are totally into someone else, and held hostage until she helps them win the woman of their dreams. Most recently, she’s matched Jane Grey, a risk analyst at NASA, with Andrew Morgan, a small town detective in the middle of taking down a corrupt sheriff. Jane is unable to see beyond her scarred past to a future with Andy, but he knows they will have something special—if he lives long enough to convince her to risk her heart. 1. Who was your first author crush and why? Oh, wow…this is sad but I really can’t remember the first. My first romance author crush was Julie Garwood. I found her book “The Secret” in an airport as I waited for a flight to London. I read it…and I think I bought three more of her books before the three week trip was over. 2. What was your first clue you were a writer? Was it a long journey or a short one? Have you always known? Writing is more like a shadow that accompanies me on the journey. It’s there regardless. I’ve always told stories (although Mom sometimes called them fibs) and I’ve been blessed to earn my living as a writer. 3. What are some of your writer-esque quirks (do you have to be in your pjs? always facing the door? Do people look at you after something funny happens and say ‘that’s going in a book, isn’t it?’)? I have to have background noise to really lose myself in the process. TV, music, coffeehouse chatter all work equally well. 4. Finish this joke: A clown, a priest and a writer all get onto an elevator…and I am so not good at being funny on demand. My mind immediately went to a zombie with a seeing eye dog standing in the back corner. Nothing good can come from that. 1. pick 6 sentences from your wip, finished draft or published work. I waved down at him and he saluted me back, turned and got into his car and drove away. I went to 16C, pushed the door open and flung my jacket and purse while my keys dangled from my hands, unused. Did I leave the lights on? bedroom. That was wrong; I lived alone. Guest writer, Julia Phillips Smith!!! Here’s a real treat, once a week I’m going to try to get guest writers in to talk to you all. Nothing super formal but hopefully lots of fun! And my very first guest here it my RWAC friend, Julia Phillips Smith! Her book, Saint Sanguinus is a top notch read! Like many people in the arts, my jobs have run the gamut – from box office for cinema and The National Ballet of Canada, to front-of-house staff for a big city performing arts centre. I’ve worked retail in an eight-story landmark flagship store, and in a small town dollar store. I’ve had the life-affirming adventure of being a live-in nanny, and the irreplaceable time spent providing elder care to my late Gram. I migrated into the 9-to-5 world of offices, morphing into records management for my Clark Kent job. All the while, I’ve been telling stories. I live with my husband, our dog and my mom on Canada’s east coast, where the rugged sea and misty forests feed my thirst for gothic tales. My first author crush—now that’s a tough one. I’d have to say Mary Stewart for her Merlin series. THE CRYSTAL CAVE was a life-changing book for me, one that led directly to my own debut Dark Ages vampire novel. What’s a few decades in between? Her detailed author notes that told of her research into a time period still not as understood in 1970 as it has been with recent thermal imaging held me riveted, as much as the story itself. Her passion for authenticity in turn led me to my own lifelong love affair with that time period. The 2009 news story of the Staffordshire Hoard—a thrilling archeological discovery of Anglo-Saxon jewelry and weapons fittings—nearly sent me into paroxysms of joy. In retrospect I was always in the midst of a story. I also seriously went about writing my own Little House-esque novel, complete with Garth Williams-inspired illustrations. And I wrote poetry from a young age—for fun. Which I still do, today. I suppose I realized that other people saw me as a writer when my grade nine English teacher asked me to write original short stories showcasing aspects like setting, plot, character, etc. instead of handing in the essays that the rest of the class were passing in. My typical writer quirk is habitually staring off into la-la land the moment I’m not specifically engaged in conversation or intently focused on a task. I think this is a basic writer thing, and for me it’s rather pronounced. I also prefer to write with my headphones on, listening to music. And when I say ‘prefer’ I mean I use the putting-on of the headphones as a ritualized signal that it’s time to start writing fiction. Oh, man. I’m not a comedy writer. I write tragic historical horror/fantasy. A clown, a priest and a writer all get onto an elevator. The clown asks for floor 13. The priest looks at the number panel, intending to press the button, only to realize there’s only floor 12 and floor 14. He looks back toward the clown to explain, only to see that he’s alone with the writer. “Where did he go?” the priest asks. But the writer continues to stare at the elevator doors, as though unaware of the priest’s existence. When the doors open and the writer exits, the priest tries to follow him, but an unseen hand pulls him back inside the elevator. The doors close. The elevator begins to go down. Down. The numbers in the overhead display can’t keep up. The priest tries to pray, but the gloved hand of the clown presses firmly over his mouth. NY or LA – NY! Thanks Julia, I hope you had as much fun as I did! If you’d like to learn more about Julia or her books, visit her site HERE. A little late, I know. Choose six sentences from a wip, finished project or published release of yours. Post them. That’s it. Want to see more? Go here. The crow was back. It was outside my window, cawing loud enough to wake the dead. Franco noticed it too. “Morgan? Isn’t that your place?” he peered over his steering wheel. Acking comes from the whole ‘Ack I’m not finished the Damn Book yet’. I’m close, but something is missing. I have a general idea of what is going to happen but someone is dragging their feet getting there. Not sure if its the mc who doesn’t want to face what’s happened to her family, Tyr who doesn’t want to fess up to what he’s done or me because if I finish the book then it will be over. I know this is the first book in at least four, so I won’t technically be away from these characters for long, but it’s like going to visit friends sometimes. You really don’t want to go, you’re having such a good time with them (or in this case, awful things are happening and you don’t want to leave them just yet). It’s not like I won’t have to go back and edit this one before I let it see the light of another person’s hard drive, except my CP (God bless and keep you!). I’m being a ninny, I know I’m being a ninny and still… I’m a ninny. The Hacking comes from being sick. A good patient, I do not make. I’m not the one who wants to cuddle and get kisses and be coddled. Don’t give me chocolates or stuff animals, magazines or books I haven’t chosen myself. Leave me alone, preferably WAAAY alone. I do not want to be touched. I’m gross and phlemy and if you want to touch me like this you’re insane and I have no bones about telling you…and while I’m picking these bones, there’s a list I’ve been meaning to ‘discuss’ with you. I have to do a lot of apologizing when I get better. Most people I love know to leave me alone, when I’m sick. They pop in to make sure I’m eating (something I don’t do much of when sick, which makes me more sick, I know), might cook me soup (I love soup) but they don’t interact much with me. And I’m grateful. I had to put on my ‘Happy Face’ for the kiddos that came to visit today. Which makes me grumpy, because I’m hacking and coughing and sputtering and going through tissues a box at a time. The kids think I’m a freaking moron, my cousin gives me a pitying look, and my mother tries to keep me away from everyone so I won’t have too much apologizing. And my cat tries to permanently attach herself to my lap…even while standing. She loves the computer, the table I’m sitting at, she’ll even give the kidlets love (not much mind, she’s a little skittish around the minis), all in an effort to make me feel better. I love her, I really do, but come on. Cuddle on the bed, while I’m sleeping. Now excuse me while I continue acking and hacking my way to THE END. My book will not die at this point.